By Martin Morse Wooster: Ellen Vartanoff, long-time fan, art teacher, and contributor to DC and Marvel Comics, died on March 17. She had ovarian cancer for several years. Ellen was a long-time member of four area clubs in the Washington, DC area: the Potomac River Science Fiction Society, the Silver Spring Science Fiction Society, Knossos, the Washington branch of the Mythopoeic Society, and the Panthans, the Washington branch of the Burroughs Bibliophiles. Her first fannish activity came in high school, when in the late 1960s she founded a science fiction club at Walt Whitman High School in Bethesda, Maryland. The Future Mad Scientists of America no longer exist, but I believe they lasted until the 1980s. At her memorial service, one Mad Scientist reminded us that actors may make millions today playing nerds on The Big Bang Theory, but in the 1960s it was a proud and lonely thing to be a fan, and the club was a “safe space” for teenagers who were smart, introverted, and interested in science fiction and comics. Ellen was interested in many things, but at her core she was a comics fan. Her sister, Irene Vartanoff, and her brother-in-law, Scott Edelman, went from being letterhacks in the comics to professional careers as writers and editors. Ellen did have some work as a colorist for Marvel Comics and DC Comics. Her Marvel work includes being a colorist on issues of Captain Marvel written by Scott Edelman. I don’t know her extent of her DC work, because Marvel Comics are thoroughly indexed and DC Comics aren’t. Ellen was a walking Wikipedia of information about DC and Marvel characters. Every time I saw her at a club meeting, she’d have a sketchbook, and would sketch and listen in the way many other fans knit and listen. She’d organize expeditions to every new Marvel and DC film. Her fellow Burroughs Bibliophiles recalled that she’d regularly contribute art based on Burroughs characters to the Panthan club newsletter. She also contributed art to two Edgar Rice Burroughs books: Edgar Rice Burroughs in the Second Century, published by the Panthans in 2010, and The Mucker/Return of the Mucker, published by the Chicago chapter of the Burroughs Bibliophiles. Her love of comics wasn’t limited to English. She had a good reading knowledge of French, and when the awful Valerian and the City of a Thousand Planets came out two years ago, she brought out copies of her albums of the original Valerian strips and explained how they were so much better than the movie. A friend recalled at the memorial service taking Ellen to a chemo session in 2011. The friend had an album of The Airtight Garage, drawn by the great French artist Moebius. Ellen began reading it and showing the friend the characteristic traits of Moebius’s style. Ellen made her living as an art teacher, specializing in teaching traditional art and comics to children. Among the places she taught were he Smithsonian, the Montgomery County Jewish Community Center, and a summer school run by the Holton Arms School. Her comics classes were quite popular, and people in their twenties who took their classes told me that Ellen was a very good teacher. Visit an art gallery in Washington, and you’d often see Ellen and her students. One friend recalled spending time at the Smithsonian’s Freer Gallery, and running into Ellen introducing her students to Japanese art. Here’s an exercise Ellen gave: She’d bring out an image where the left half was Lois Lane and the right half was Minnie Mouse. She’d ask students what was similar about the images—and what was different. She was very influential in the lives of many teenagers. One man in his late fifties recalled that forty years ago he volunteered at Adventure Theatre, a children’s theatre at Glen Echo Park in Maryland where Ellen was involved in creating sets. Ellen showed the man how easy it was to make a wooden sword, and how much fun it was to bop other kids with it. The man recalled that at the time he was an English major, and didn’t realize he had any ability to make things. He then ended up creating a construction company, which he said he wouldn’t have done if Ellen hadn’t showed him he had skills he didn’t know he had. He said he was on the verge of retirement, and was looking forward to resuming studying the arts Ellen had introduced him to 40 years before. If I had to sum up Ellen in one word, it was that she was enthusiastic about life. She always wanted to know more, and when she’d show up at a club meeting, usually with Lindt chocolates and Kedem sparkling peach and raspberry juices, she was eager to learn about the latest books, movies, and plays that other club members had seen and read. She was also a very happy person. I knew her for nearly 40 years, and I never heard her snarl or be angry. Her laugh was unforgettable. Her interests were very wide. One friend recalls having a half-hour discussion with her about the differences between Turkic and Finnish. But I’ll limit her passions here to two. She was really interested in archeology, and regularly went to public lectures where archeologists would give the results of discoveries they made in the field. But her greatest passion was ancient Egypt, and one of the peaks of her life was going to Egypt in the late 1990s with a papermaking group. At the service, guests were given a card with Ellen’s photo on one side—and a cartouche of Ellen’s name on the other. Finally, she loved classical music. She’d regularly go to broadcasts of the Metropolitan Opera at a local movie theatre. I once went with her to a double bill of Cavalleria Rusticana and I Pagliacci at the University of Maryland. I Pagliacci has a children’s chorus, and the sister of one of Ellen’s students was in it. The girl and Ellen had a good conversation, and I think Ellen reminded her why classical music was worthwhile. Her sister, Irene Vartanoff; her brother, David Vartanoff, her brother-in-law, Scott Edelman, and her nephew, Trevor Vartanoff, survive Ellen. Her mother, Margaret Vartanoff, died in 2010, and I wrote a tribute to her at File 770 here. 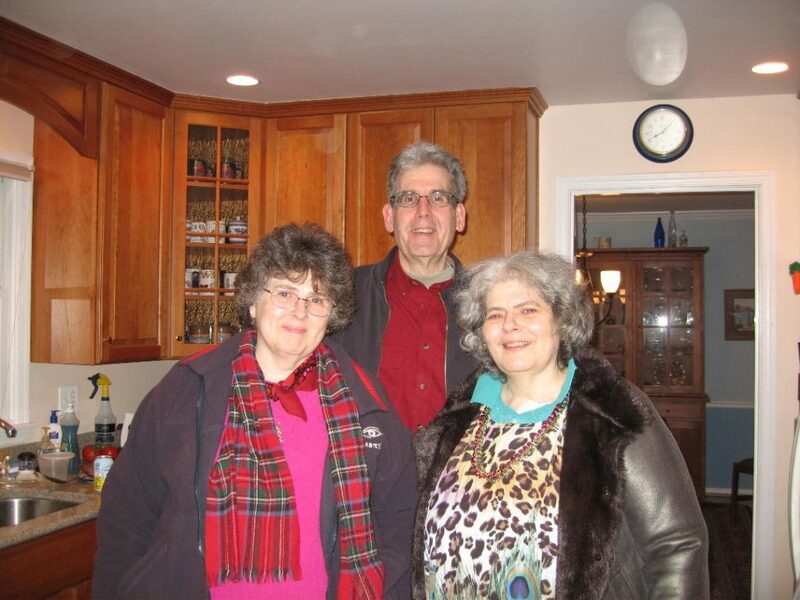 Irene Vartanoff (left), Scott Edelman (center), Ellen Vartanoff (right), New Year’s Day, 2012. Photo by Risa Stewart. This entry was posted in In Passing and tagged Ellen Vartanoff, Martin Morse Wooster by Mike Glyer. Bookmark the permalink. A friend reminds me that Ellen was also a Trekker, at least for Trek Classic. Some of her artwork for FURAHA, the fanzine of the Nichelle Nichols Fan Club, can be seen on the Fanlore wiki. Ellen was one of my closest friends. Among her many talents and accomplishments, Ellen understood better than anyone I know why the arts are not an elective. She recognized the importance of the arts to the human experience and shared this understanding with her students. I am grateful to her for passing along this appreciation of the arts to my daughter, who took classes with Ellen through the Blackrock Center for the Arts in Germantown, Maryland, for several years. We will miss her. Condolences to her family and friends. Scott Edelman was not a letterhack to comics.